So I told myself I'd suspend my pescetarianism for my trip to Argentina because the beef here is supposedly worth dying for. So I opted for this meat waffle. 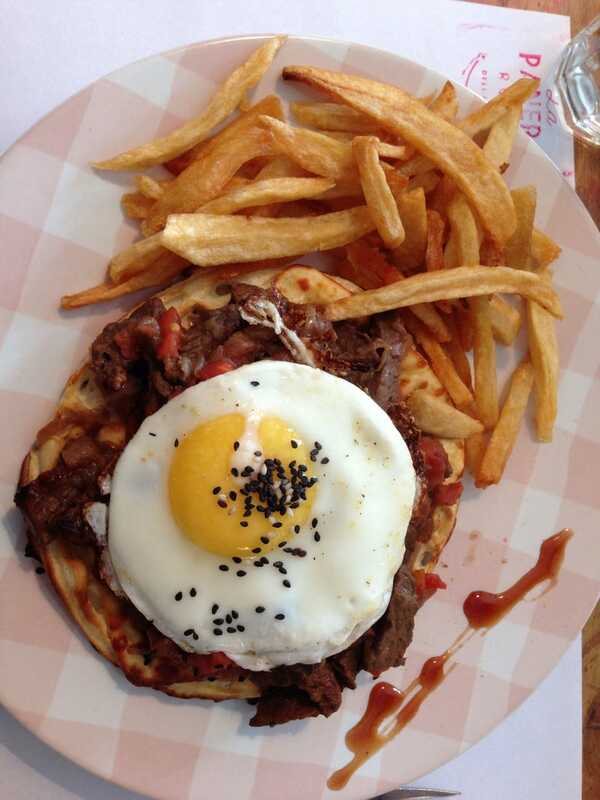 It was basically brisket on top of a waffle with an egg. It was really yummy, but I was expecting more of a meatgasm after not having eaten meat for four years. Whether the meat waffle was worth it remains to be seen...I finished it 20 minutes ago and I haven't moved since. I was planning on going for a long walk to the modern art museum (the MALBA) and I'm praying to His Noodliness that my meat waffle doesn't come squirting out of my holes. In other news, I went on an excellent bike tour yesterday and saw all the things in Buenos Aires! All my pictures are on my camera, so I'll write a post about my sightseeing when I get back to NYC and can use my laptop. Hope you're all having an awesome fin de semana! Adios!